Fascinating Athens combined with the beauty and excitement of Mykonos! From the city that never sleeps, we take you to the Cycladic island that also never sleeps! This itinerary is perfect for lovers of beauty, great beaches, and outstanding nightlife. It's a good choice for those who want to have extra time to "hit the beaches of Mykonos" and to enjoy its nightlife, or to make a short trip to other nearby islands. For your first evening in Athens, we suggest the romantic excursion to Cape Sounion, perfectly timed to catch the amazing sunset. On Mykonos, you’ll have five perfect days to do as much or as little as you want. If you’re interested in being active, we suggest our excursions to the Sacred Island of Delos, or a visit to nearby Tinos or Paros. Have a look at our one-day excursions to see all of your possibilities. Prices start from 570 € !!! Arrival at Athens International Airport. Meet our representative and transfer to your hotel. Rest of the day at leisure to begin your exploration of this incredible city. We suggest that you begin with a stroll through the streets of the Plaka area. Overnight Athens. After breakfast, transfer to the (air)port for your departure to Mykonos. Arrival at Mykonos and transfer to your accommodation. We suggest that you become acquainted with this amazing island by first exploring the tiny lanes and back streets of the town. You'll get lost, of course ... everybody does! Overnight Mykonos. Days at leisure. We suggest that you continue to enjoy and explore the most famous of the Cycladic Islands. Its rustic windmills, churches, whitewashed houses, beautiful beaches, and cosmopolitan air have made Mykonos the island of choice for the rich and famous of the world. Devote one of your mornings to visiting the Sacred Island of Delos, then take time in the afternoon for a swim at one of the island's amazing beaches. You can opt for some great tours, such as an off-road safari, or a visit to nearby Tinos, the island of artists. 4 overnights Mykonos. After breakfast, transfer to the (air)port for your departure to Athens. Arrival in Athens and transfer to your Hotel. Rest of the day free at leisure to do your last-minute shopping. or to visit some sights that you may have missed. 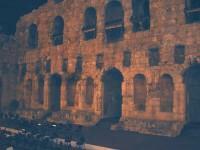 This would be a perfect evening to take our tour "Athens by Night!" Overnight Athens. After breakfast, transfer to the airport for your departure flight back home ... full of lasting memories!